25 years after the largest Maritim Hotel opened and following several partial renovations, all 555 rooms and suites, including the bathrooms, events rooms, public areas and the underground car park have now been fully modernised. The renovation that started in the middle of March 2015 and ended August 2016 was carried out by a subsidiary of Maritim, Reinhardt und Sander. Maritim Hotels invested several million euros in the renovation. In the new rooms, the beige-anthracite colour combination produces a sense of well-being; and the bathrooms have been fitted out with the latest sanitation technology and high-quality dark brown granite. Guests have always appreciated the central, yet quiet location of the Maritim Hotel Stuttgart that is only a short walk to the city centre, and that offers a view over the greenery of the idyllic Hoppenlau Park. The Königsstrasse – Stuttgart’s shopping mile and one of the longest pedestrian zones in Germany – can be comfortably reached by foot in just a few minutes. Event organisers also particularly appreciate the historic Riding Hall and the adjoining Liederhalle Culture and Convention Centre. The story of how the building came into being is very unusual: When Maritim Hotels expressed an interest in the land, it came across a 19th century riding hall that had been ravaged by time. The elaborate ceiling construction made from steel adorned with glittering chandeliers revealed the hall’s more glamorous past. Maritim recognised the value and restored this jewel. “Since then, the old Stuttgart riding hall has become one of the top locations in the capital of Baden-Wuerttemberg for special and festive events,” reports the General Manager, Alexander Buck. 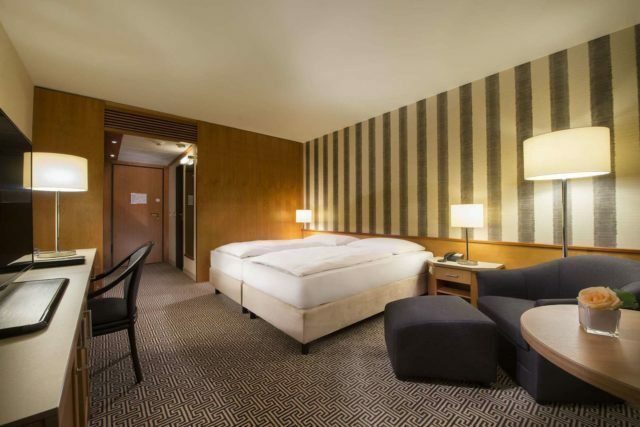 The Maritim Hotel Stuttgart also has a direct underground link to the Liederhalle Culture and Convention Centre (KKL), whose rooms can be used to host up to 2,200 people for events. “As the largest hotel in Stuttgart, we have unique meeting facilities that were also redesigned during the renovation, and include the Reuchlin restaurant, the piano bar and the Rotisserie,” sums up Alexander Buck. Tip: Barely 40 kilometres from Stuttgart, lies Metzingen, the home of HUGO BOSS and the headquarters of the well-known outlet village with 70 brand boutiques. A short while ago, a shuttle was introduced between Outletcity and the Maritim Hotel Stuttgart. The bus always operates on Mondays, Fridays and Saturdays from in front of the main entrance of the hotel to the outlet village in Metzingen. A return journey costs 10 euros per person if booked online. SOURCEGCB German Convention Bureau e. V.